With a common difference of 12, the arithmetic progression 210, 222, 234 is an intriguing element of Bible gematria. These numbers recur frequently on these pages, beginning with the 210 years of the exile in Egypt. As well as being in sequence, each of these numbers are also "straight-line" numbers". 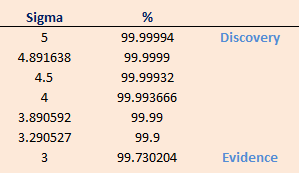 Any number of three or more digits (> 99) is said to be a straight-line number if it's digits form an arithmetic progression, as you can see in the following graphs of our three numbers. this verse begins with "Here is wisdom…"
The duration of the great tribulation is given as 3½ prophetic years or "a time, and times and half a time" (Dan 7:25, 12:7, Rev 12:14) for a total of 3½ x 360 = 1260 days. In Genesis chapter 1, the first verse encapsulated the beginning of God's creation, and in the final verse God saw that every thing was very good at the end of the sixth day. The gematria values of these first and last verses of the first chapter of Genesis sum to 5766. A flock of starlings fly over an agricultural field near the southern Israeli city of Netivoton on February 12, 2014. 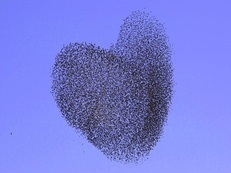 The starlings migrate from central and Eastern Europe to spend the winter in Israel. The Hebrew word for heart (לב) has a gematria value of 32. For a slideshow gallery of unusual formations of starlings in the sky over Israel, click here or here. Country music star Hank Williams 1948 recording of "I Saw The Light" in which he quotes Mat 7:14. 1948 was the year of Abraham's birth (Hebrew calendar) and the establishment of the modern state of Israel (Gregorian calendar). Up until 1967 global standard time was calculated astronomically from the rotation of the earth on it's axis. This was an extremely accurate method, but not precise due to various anomalies including earth's elliptical orbit and the fact that the earth's rotation is gradually slowing. In modern times, the need for precisely synchronised time has important applications in navigation. Satellite-based global positioning and navigation systems share one common clock frequency and one common, highly synchronised system time. In the quest for the necessary precision, timekeeping passed from the domain of astronomers to physicists. The second, which had previously been described as 1/86,400th of a mean solar day was from October 1967 more accurately described as "the duration of 9,192,631,770 periods of the radiation corresponding to the transition between the two hyperfine levels of the ground state of the cesium 133 atom." More simply, it is based on the frequency of light emitted by cesium-133 when exposed to microwave radiation, as explained in the following video from the National Institute of Standards and Technology. By measuring this frequency, the value of 9,192,631,770 per second has been assigned. The new NIST-F2 atomic clock is accurate to within 1 second in 300 million years! This equates to the number of oscillations of a cesium-133 atom in one second, to an accuracy of 99.994%. To keep our atomic clocks from running too far ahead of time as determined by the Earth’s rotation, every year or two the captains of global timekeeping add a second to atomic time before broadcasting this adjusted time out to the world as Universal Coordinated Time. The adjustment’s unassuming little name is the leap second. Ten of them were tacked on to UTC all at once in 1972, and another 25 have been added since. No. 26 is slated for the end of June 30 2015, just before midnight. "The leap second that syncs the world's clock with the sun could lead to a disaster"
Particle physicists describe the certainty of a result on a scale that goes up to 5 sigma. One sigma could be a random statistical fluctuation in the data, 3 sigma counts as evidence, but only a full 5-sigma result is a discovery. By definition, the probability that a 5-sigma result is wrong is less than one in a million. Writing Guidelines - CERN. According to this scale, the above calculation represents strong evidence for the existence of God. The 5-sigma scale used by physicists to describe the relative certainty of a result.